We take school holidays seriously at South Bank – whether you’re searching for swimming facilities, playgrounds, chocolate cafes or anything in-between, you’ll always find something to do. 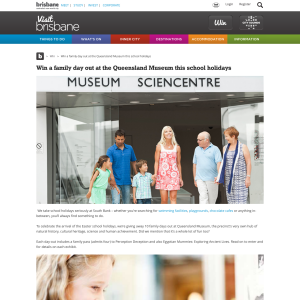 To celebrate the arrival of the Easter school holidays, we’re giving away 10 family days out at Queensland Museum, the precinct’s very own hub of natural history, cultural heritage, science and human achievement. Did we mention that it’s a whole lot of fun too? Each day-out includes a family pass (admits four) to Perception Deception and also Egyptian Mummies: Exploring Ancient Lives. Read on to enter and for details on each exhibit. Mind melting illusions, sensory sensations, playing with perception, and discovering the world inside your head are all part of the exhibition Perception Deception. Is what we see, hear and feel real? Challenge your sensory signals and explore how your brain perceives the things and people around you. Discover how people may perceive the same thing in a different way and that reality is not what it seems. Test your balance while walking along a path wearing special glasses, make your arms feel like they are floating, see into infinity and watch a ball disappear in mid-air. Explore your visual, multisensory, social and audio-language perception. Perception Deception is the ultimate hands-on, minds-on exhibition of mind trickery to test and fool your perceptions. Meet six mummies and unlock the secrets behind their wrappings using the latest CT scanning technology in Egyptian Mummies: Exploring Ancient Lives from 16 March 2018. Featuring more than 200 artefacts from the world famous Egyptian collections of the British Museum, gain insight into the life and death of those six individuals who lived in Egypt between 3000 and 1800 years ago. Discover how they were embalmed and what life along the Nile valley was like. Explore visualisations based on the CT scans of the mummies, as well as ancient texts, coffins, masks and funerary objects to unravel their mysteries. The presentation of this exhibition is a collaboration between the British Museum and the Queensland Museum. 1. Information on how to enter the competition forms part of the competition conditions. 2. Competition entry is deemed acceptance of these terms and conditions. 3. Prize: a) 1 of 10 x family passes (admits four) to see Perception Deception and the Egyptian Mummies: Exploring Ancient Lives exhibtion at Queenland Museum in season. Terms and conditions of entry are printed on the pass. b) The prize is not exchangeable or transferable and cannot be redeemed for cash. c) Any additional expenses incurred by the prize winners, other than those outlined in these terms and conditions, are the responsibility of the winners. d) Prize winners are themselves subject to the specific terms and conditions of the providers. 4. Competition period: The competition opens on 9 March and closes at 9am on 30 March 2018. 5. How to enter: Complete the entry form and submit. 6. Eligibility: To be eligible to enter this competition a person must: a) Be a permanent resident of the State of Queensland b) Not be an employee or contracted staff of Brisbane Marketing, a sub- unit of administration of the Promoter; and c) Be over the age of 18 (proof of age may be required to receive prize) or have the consent of one of his or her parents or guardians to enter the competition. 7. Competition draw: The winners will be drawn at random. The decision shall be conclusive and no correspondence will be entered into. The drawing of the prizes will be conducted at Brisbane Marketing at South Bank House, Stanley Street Plaza, South Bank, QLD 4101. 8. Winner Notification: Winners will be notified by email by 5pm 30 March 2018. If no reply email is received within two days, the prize will be void. 9. Brisbane Marketing will inform the winner about ticket collection once they’ve been selected. 10. No Liability of Promoter: The Promoter accepts no responsibility whatsoever for late, misplaced, lost or ineligible entries. The Promoter makes no representations or warranties as to the quality, suitability or merchantability of the prizes. To the extent permitted by law, the Promoter is not liable for any loss or damage whatsoever which is suffered (including but not limited to direct or consequential loss) or for any personal injury sustained in connection with the entry into the competition or acceptance of the prize. This paragraph is not intended to exclude any liability which cannot be excluded under Australian consumer protection laws. Any such liability is limited to the resupply of the prize. 11. The Promoter reserves the right to alter or amend these terms and conditions and/or to cancel the competition at any time prior to the competition opening without further recourse to the entrants. 12. Entrants must fully and correctly complete and submit the entry form on website. If you do not supply the information, your entry will be deemed invalid. You may only enter this competition once. 13. Force Majeure: If for any reason this Competition is not capable of running as planned (including due to infection by computer virus, bugs, tampering, unauthorised intervention, fraud, technical failures or any other causes beyond the control of the Promoter), which corrupts or affect the administration, security, fairness, integrity or proper conduct of this Competition, the Promoter reserves the right, in its sole discretion, to take any action that may be available, and to cancel, terminate, modify or suspend the Competition. The Promoter reserves the right it its sole discretion to disqualify all entries from any individual who tampers with, or benefits from tampering with the entry process which as a result corrupts or affects the administration, security, fairness, integrity or proper conduct of the Competition. 14. By entering this competition, you are agreeing to receive email updates from Brisbane Marketing.